Homepage. This page: A handy post-war conversion for pop-up semaphore indicators. This handy little conversion was aimed at any motorist who was dissatisfied with his old-style semaphore trafficators, but didn't want to drill his car's wings to install replacement flashing indicators. 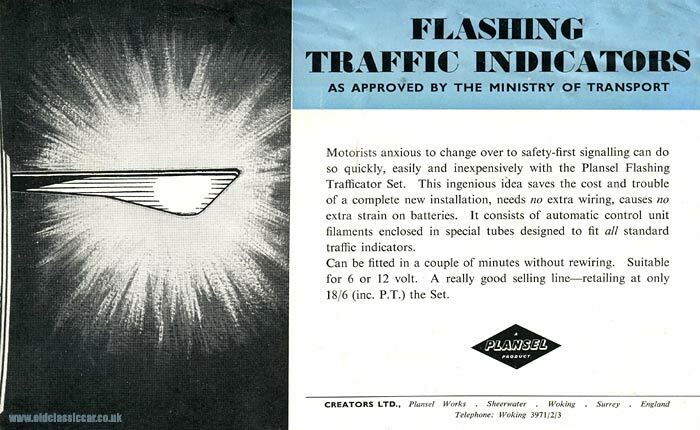 The Plansel Flashing Trafficator Set was the solution, produced by Creators Ltd of Woking, in Surrey. "This ingenious idea saves the cost and trouble of a complete new installation, needs no extra wiring, causes no extra strain on batteries. It consists of automatic control unit filaments enclosed in special tubes designed to fit all standard traffic indicators. Can be fitted in a couple of minutes without rewiring. Suitable for 6 or 12 volt." Were these flasher lamp conversions popular? I've never seen a set in use, and I'm sure if they were available today, they'd sell very well. Many owners of pre-war and vintage cars aren't keen on relying on semaphore indicators, yet don't want to add inappropriate-looking flashers. A set of these Plansel trafficators would fit the bill perfectly, offering flashing indicators without altering the look of the car. I'm sure some older-car owners, with a penchant for car electrics, have been able to cook up their own version of this neat idea. The cost for the Plansel conversion? just 18/6 (including Purchase Tax). See more gadgets and accessories. A page describing common maintenance requirements on Lucas (and similar) trafficator units, has been added to the reference library section here at OCC. You can find it on this page.